Do you know what the quickest, easiest way is to find a luxury game lodge in South Africa? Without a doubt, most people, be they South Africans or visitors to this country from abroad, will immediately go to the internet in their search for such prestigious accommodation, probably by entering the keywords “luxury game lodge South Africa”, and they’ll be presented with any number of prospective choices. One of these truly special lodges on the prospect list is bound to be Fifty Seven Waterberg, our 5-star luxury game lodge formerly known as Molenvliet Lodge, located in the Welgevonden Private Game Reserve. Welgevonden is part of the Waterberg Biosphere Reserve on a UNESCO World Heritage Site, declared as such in 2001, and a special place amongst many in South Africa. The Tourism Grading Council of South Africa’s star rating is an extremely helpful guideline that assists guests to determine whether a game lodge (or other type of establishment) is luxurious. The more stars the lodge has been awarded, the grander it will be. Those that sport four or five stars are classified as luxurious. 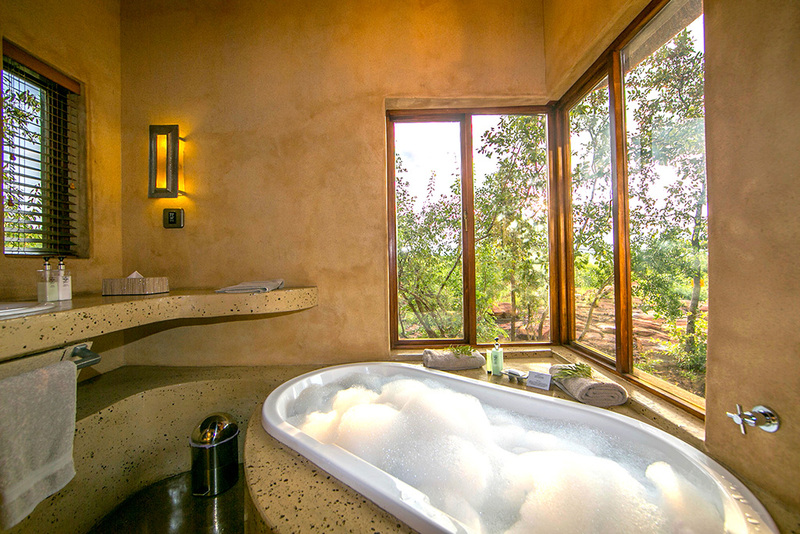 Fifty Seven Waterberg has 5 stars, as well as several other accolades. We’re proud to have been voted as having one of Travelmyth’s top 5 Accommodations in Welgevonden Game Reserve, and have a TripAdvisor’s 2017 Certificate of Excellence. Another accolade to which we can proudly lay claim and one that is of particular significance to our international guests is featuring in the National Geographic Traveller’s Africa Collection. Our five double guest suites are exceptionally spacious. Each occupies at least 80 square metres, enabling our visitors to spread out and relax in ultimate comfort. Furnishings and appointments may best be described as representing the clean design lines of modern “understated elegance”, in the colours and shades of Africa. Also in keeping with our African spirit, suites are named after typically African wildlife antelope species – Rooihartbees, Zebra, Gemsbok, and Springbok – and an African cattle species – Nguni. Gemsbok and Springbok are super luxurious suites, perfect for honeymooners. Rates are quoted in ZAR, because we strive to provide our countrymen with luxury accommodation at rates that are as affordable and competitive as possible. Look out for our special offers too. Currently, in September 2017, we’re offering super discounts for guests who book their accommodation within 2 or 7 days of their arrival. All meals are included, as are daily guided game drives to view South Africa’s wild animals, the principal reason why people love to visit game reserves. Our game drives take place at the best times to find and view animals – early mornings and just before dusk. You’ll want for nothing at Fifty Seven Waterberg. Fine dining is the order of the day, enjoyed under the vaulted thatched roof of our dining room, or in the cosy confines of our beautiful, lantern-lit boma. Warm South African hospitality awaits you at our luxury game lodge. When may we expect your arrival?